Dog products usually ship within 1-3 days. This dog kennel is shipped complete in a carton. You can easily assemble the unit using common hand tools and easy-to-follow, step-by-step instructions. Our products are great for dog training, dog breeders and pet owners. The dog kennel door can be installed on any side of the kennel (must be on one of the corners). Photo sent by Todd and Heather. Todd said, "This kennel was so easy to install. Usually my wife and I fight during home projects, but not with this one! That's how easy it was." 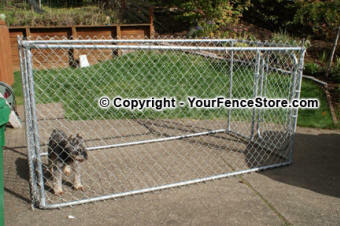 All aluminum fences are currently 10% OFF. Email us for a quote on chain link products. How do I know what fence slat will fit into my fence? Privacy Fence Slats are the perfect choice to add privacy to your fence. Manufactured to your measurements. We can custom make just about any size of windscreen. Contact us if you need help with your vinyl deck and railing project. Great price, quality and service on Dog Products. ©2000 - YourFenceStore.com All rights reserved.